The concept of Industry 4.0 is often seen as somewhat woolly and difficult for manufacturers (its core audience and potential customers) to get their heads around. Its other names are not much clearer: Internet of Things, Cyber-physical systems; machine-to-machine communication is perhaps the most descriptive, but even that tends to be shortened to the enigmatic M2M. But now, factory operators have a chance to see how Industry 4.0 works in a real setting to understand how it could actually improve efficiency and reduce costs. 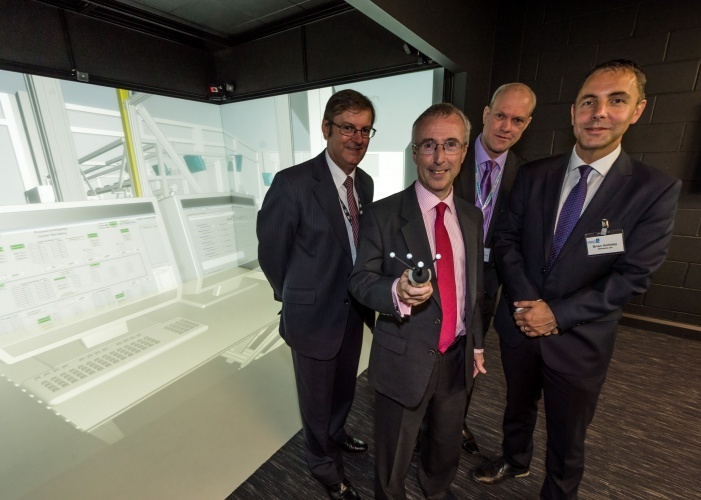 A group of organisations, including industry bodies ESCO (electronic systems community) and the automation trade association GAMBICA, industrial equipment giants Siemens and Hewlett-Packard and specialists Shadow Robot and Ubisense have come together to build the UK’s first digital factory demonstrator. Also known as the Industry 4.0 demonstrator, it comprises a virtual 3D factory alongside a physical production line that is designed to demonstrate mass customisation of consumer goods. Housed at the Manufacturing Technoloy Centre near Coventry, the demonstrator uses existing real-world machines to model a continuous production line. 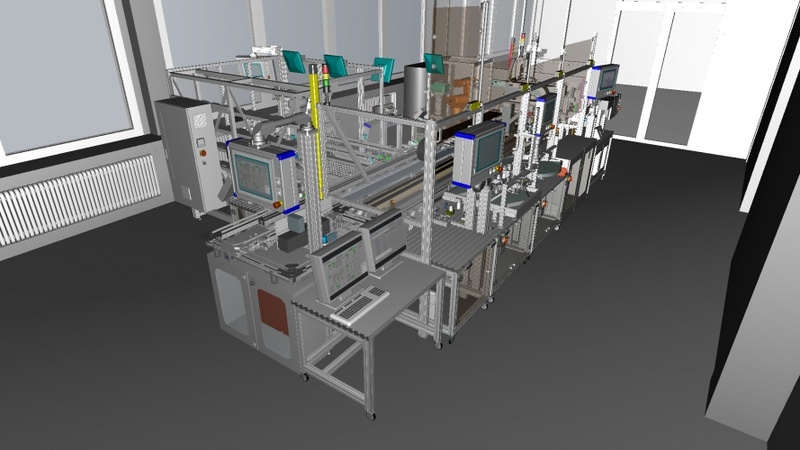 The virtual 3D factory allows users to interact with the system as a ‘living lab’ into which the latest technologies can be dropped to illustrate how the output from sensors around the machinery is used to alter the function of robotic elements of the production system. Industry 4.0 is a major focus for Siemens. The chief executive of its automation division, Anton Huber, sums it up as the ability ‘to literally have everything imaginable connected to a network so that information from all these connected “things” can be stored, transferred, analysed and acted upon in new, and usually automated ways via network connections with everything else’. The basis of this is to network machinery, control systems and sensors together, so that all the data from the production process can be used to make decisions on manufacturing. For example, Huber said, statistical evaluation of data can be used to help optimise machinery’s operation and reduce the risk of outages; and variables vital to continuous operation, such as fan speeds, humidity, and temperature, can be monitored and if one of them goes out of range the system management software can automatically adjust the machinery to bring it back into range, ‘essentially solving a problem before it results in machine downtime or compromised quality’. Huber identified six technology advances that will play a role in the development of Industry 4.0. Three of these are connected with machinery; direct machining in mass production, with alloy parts replacing injection-moulded plastics in housings and frames, a trend that can already be seen in tablets and laptops; increased use of additive manufacture in custom design, especially in high-performance components; and safe human-robot cooperation. The other three are connected to software: digitisation of the entire value-added process, enabling better simulation and thereby reducing time to market; integration of supplier and production network via internet-based product lifecycle management, so that engineers throughout the network can collaborate; and autonomous production with semi-autonomous robots working alongside humans to accelerate production while ensuring quality standards. our strengths and tackles many of the complex production and consumption challenges we face today.’ Such investment could boost productivity by up to 30 per cent, he claimed. Holliday says that industry and the government should establish a £12 million fund ‘as part of a specific push to co-develop the world’s most advanced manufacturing technology standards here in Britain’. This, he said, would both address a looming skills shortage, as well as helping to increase manufacturing’s share of the UK’s GDP. GAMBICA’s deputy director Steve Brambley, commented that some features and technologies associated with Industry4.0 are already becoming quite common in manufacturing. In particular, he said, using input from sensors to adjust fan speeds using variable speed drives is an established way of reducing electricity usage. Increasing the connectivity within a factory, for example by using an industrial wireless network, can also improve efficiency, he said, by authorising different machines to operate independently and power down any parts of the plant that aren’t needed at a specific time. This is helped by the use of distributed processing around the factory, using low-powered processors such as those developed for smartphones and tablet computers. ‘Industry 4.0 is an opportunity for the UK to apply its many skills and technologies, and gradually become one of the first states to eliminate low-cost labour as a prerequisite of a successful manufacturing economy,’ he said. Strategic thinking and co-ordinated action, such as the steps that Holliday suggested, could mean that ‘Industry 4.0 could be the reason why the UK is ultimately successful in redefining itself as a manufacturing-driven economy’.